Eggplant Lasagna Fill 1 Created with Sketch. This quick and easy lasagna will blow your mind. 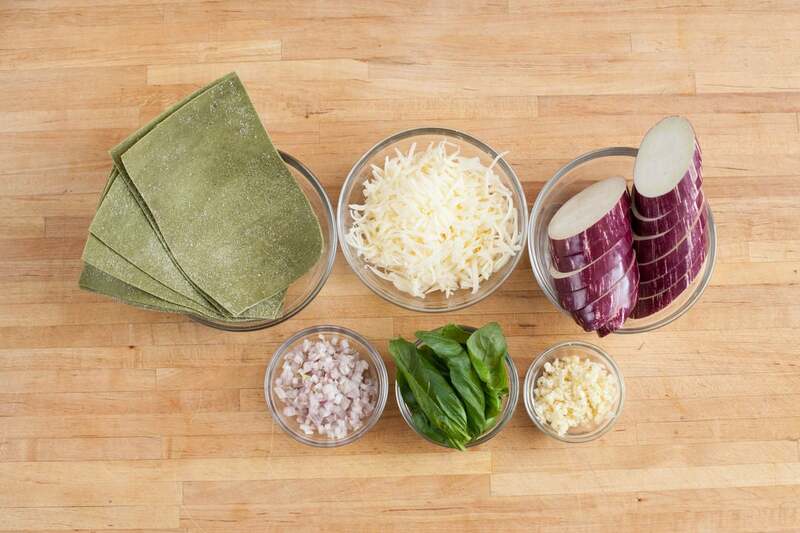 Traditional lasagna is a time-consuming process that can take hours. 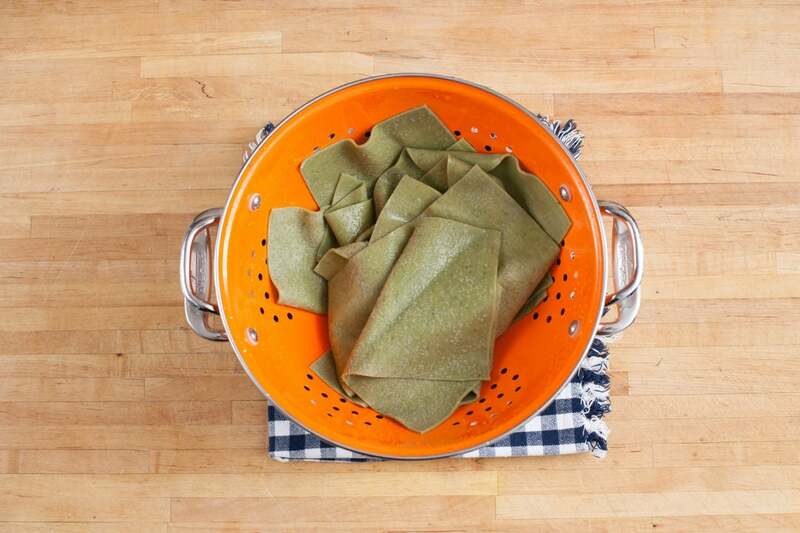 In this recipe you’ll use fresh spinach pasta and a creamy, smooth béchamel (one of the 5 French mother sauces) for a dish that preserves the deep, rich flavors of the classic but serves it in a fraction of the time. But what to do with the minutes you save? Enjoy! Preheat the oven to 450°F. Wash and dry the fresh produce. Heat a large pot of salted water to boiling on high. If necessary, trim the fresh pasta sheets to fit the bottom of your baking dish. Peel and mince the garlic and shallot. Grate the mozzarella cheese. Pick the basil leaves off the stem. Slice the eggplant on an angle into ¼-inch thick slices. In a small pot, heat 2 teaspoons of olive oil on medium until hot. Add the shallot and garlic and season with salt and pepper. Cook 3 to 4 minutes, or until softened, stirring frequently. Add the crushed tomatoes and season with salt and pepper to taste. 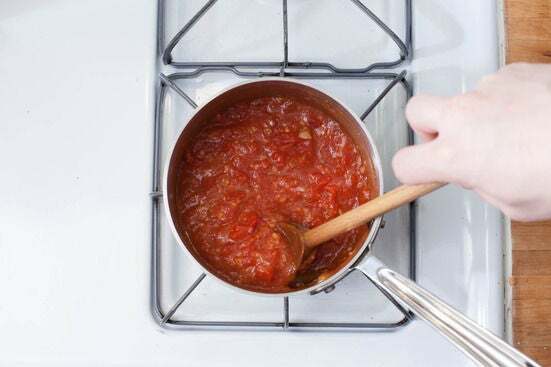 Reduce the heat to medium-low and cook 10 to 12 minutes to develop the flavors and slightly reduce the sauce. Remove from heat. While the sauce is cooking, in a large pan (nonstick, if you have one), heat 2 teaspoons of olive oil on high until very hot. 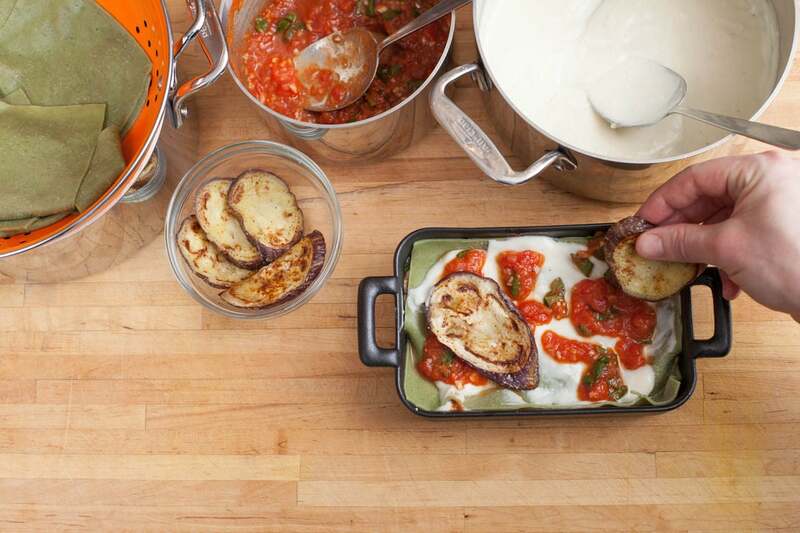 Add the eggplant slices in a single, even layer and season with salt and pepper. Cook 3 to 4 minutes, or until browned. 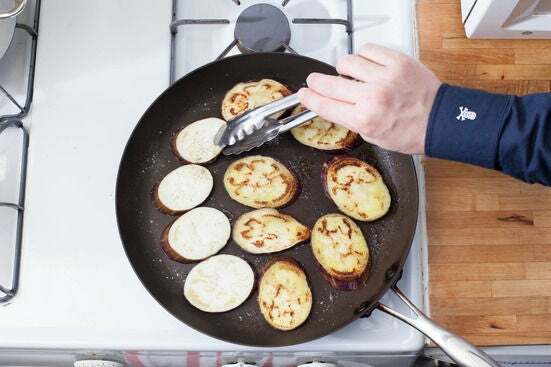 Flip the eggplant, add a little more oil to the pan and season with salt and pepper again. Cook an additional 3 to 4 minutes, turn off the heat and set aside, leaving the eggplant in the pan. In a medium pot, melt the butter on medium heat. Whisk in the flour and cook, stirring frequently, 30 seconds to 1 minute, or until light golden brown. Slowly whisk in the milk until no lumps remain. Cook, whisking frequently, 7 to 9 minutes or until thickened. Remove from heat and whisk in half of both the Parmesan and mozzarella cheeses until thoroughly combined and smooth; season with salt and pepper to taste. 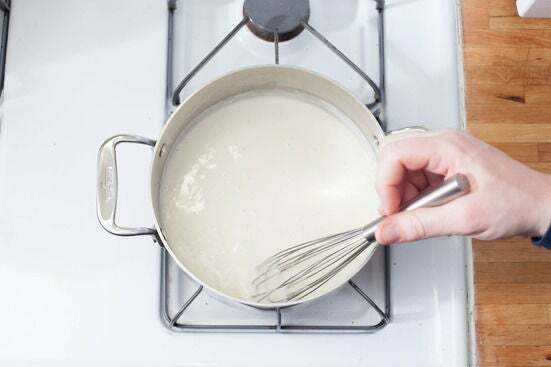 While the béchamel sauce cooks, add the pasta sheets to the large pot of boiling water and cook 3 to 4 minutes, or until tender. Drain thoroughly and rinse with cold water to stop the cooking process. Into the tomato sauce, stir all but a pinch of the basil (tearing the leaves before adding if you like). 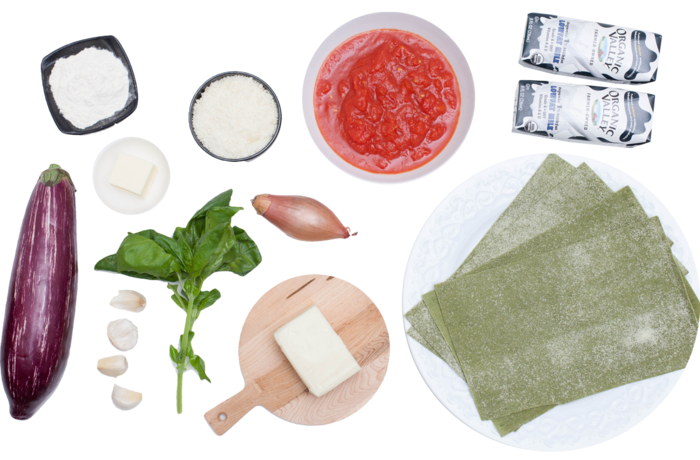 In an oven-safe baking dish, (preferably 10 x 7, high sided) assemble the lasagna by alternating layers of tomato sauce, eggplant, pasta and béchamel sauce until you reach the top of your baking dish (you may have extra pasta, eggplant or sauce). Top the final layer of the lasagna with the remaining Parmesan and mozzarella cheeses. Bake 10 to 15 minutes, or until the cheese is melted and bubbly. Remove from oven and let stand for at least 5 minutes before serving. 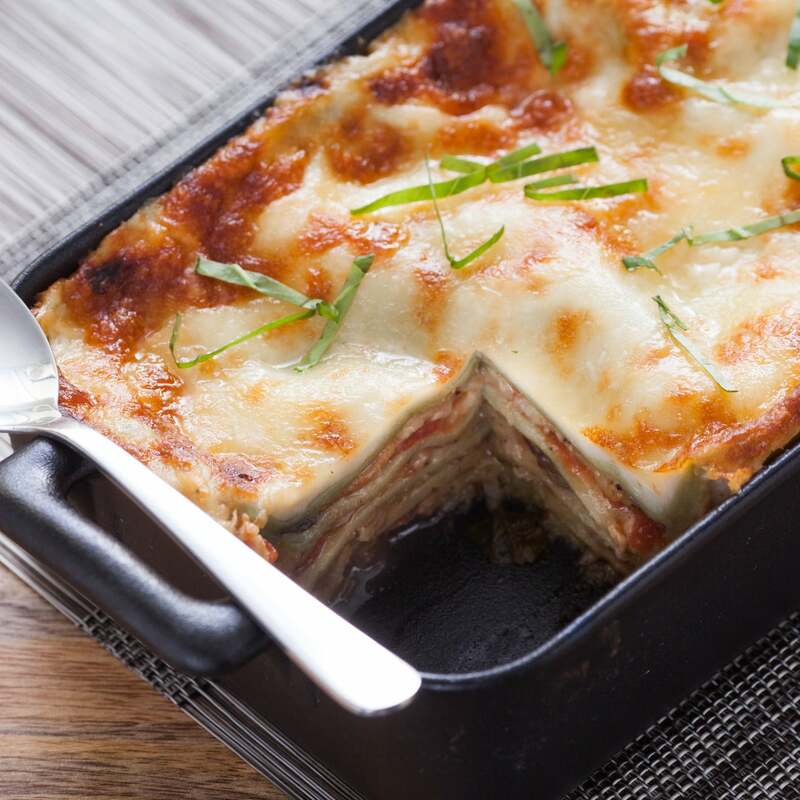 To plate your dish, divide the lasagna between 3 plates. Garnish with the remaining basil. Enjoy!